Figure 1. Expression comparison between a commercial vector from one of major suppliers (1) and the first-version ATGCell vector REEMAC1 (2), for three different proteins (A, B, C and D) stably expressed in CHO cells. Proteins were collected from the culture medium and probed with an epitope antibody in a Western blotting. Figure 2. Expression comparison between the first-version vector REEMAC1 (1) and the second-version vector REEMAC2 (2). REEMAC vectors hosting human interferon-α1 gene were transiently transfected (upper panel) and stably transfected (lower panel) in CHO cells. Expressed proteins were collected from the culture medium and probed with an epitope antibody in a Western blotting. Figure 3. Expression stability analysis among different REEMAC vectors (1. REEMAC2; 2. REEMAC2Q; 3. REEMAC2R). Human interferon α1 was stably expressed in HEK or CHO cells. 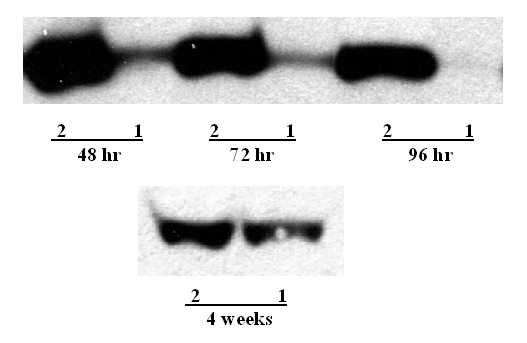 Stable cell lines were cultured for over a period of time, as indicated. 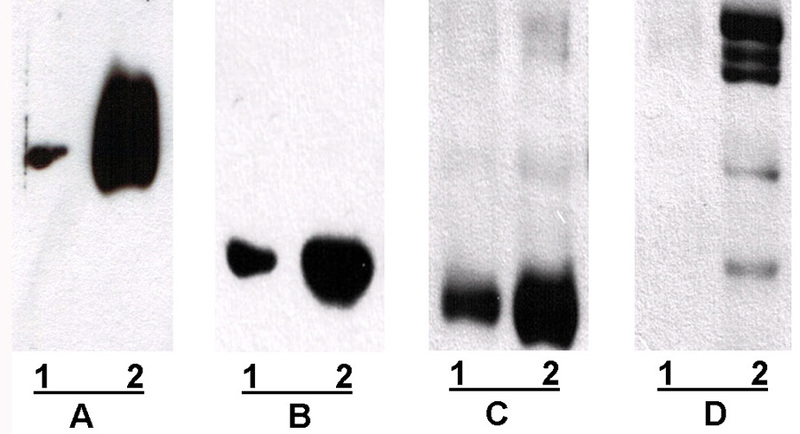 Expressed proteins were collected from the culture medium and probed with an epitope antibody in a Western blotting. Figure 4. Sample proteins stably expressed in HEK cells. Chemokine family: 1 CCL2; 2 CCL3; 3 CCL4; 4 CXCL1; 5 CXCL2; 6 CXCL4; 7 CCL3; Interleukin family (IL): 8 IL5; 9 IL7; 10 IL8; Interferon family (IFN): 11 IFN-α1 ; 12 IFN-α4; Cell surface antigens: 13. CD40; 14 CD54; Cytokine receptors: 15 Tumor necrosis factor receptor type 1; 16 Tumor necrosis factor receptor type 2; 17 Epithelial growth factor receptor; 18 Nerve growth factor receptor; Reporter gene: 19 green fluorescent protein (GFP); Transcription factor: 20 P53; Protein kinases: 21 MAP kinase-3; 22 Protein kinase A α-subunit; 23 Cyclin-dependent kinase-2. Figure 5. Purified sample proteins. Coomassie staining of interferon-α1, chemokine CXCL1 and interleukin-5 (tagged), nerve growth factor and two monolconal antibodies (tag-free) after single-column affinity purification. Table 1. Expression levels of sample proteins stably expressed in HEK and CHO cells.